I made myself a pair of these fleece fingerless mitts a few years ago and wear them (almost) year-round! After many compliments from friends and strangers alike - and requests for a pair of their very own - I am happy to report I am now in full production mode! While not yet available in my Etsy shop, there will be a big selection of them at my next (and final!!!) 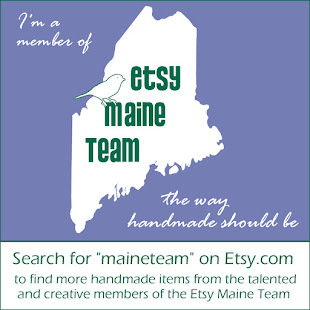 show of the season: ROOST Dec. 5 & 6 in Belfast, Maine. In colors and sizes for both men and women, each pair is embellished with fun and funky buttons - some vintage, some new. Textured vinyl and pleather are also fun. The bags are lined with recycled sail cloth which makes them water-resistant and easy to wipe clean!